What Day Of The Week Is May 14? 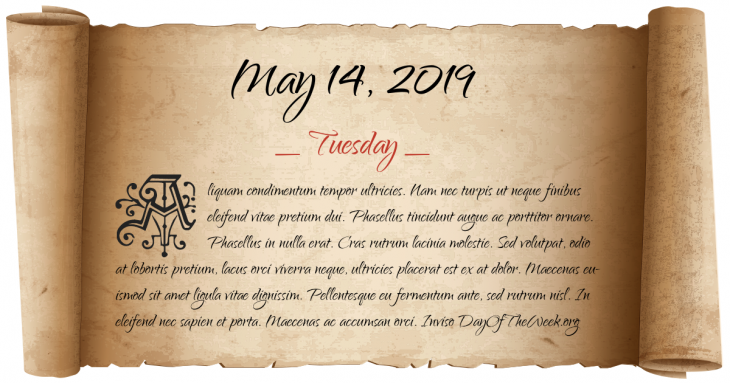 May 14, 2019 is the 134th day of the year 2019 in the Gregorian calendar. There are 231 days remaining until the end of the year. The day of the week is Tuesday. Edward Jenner administers the first smallpox vaccination. The Treaties of Velasco are signed in Velasco, Texas. Virginia Woolf’s novel Mrs Dalloway is published. A Japanese submarine sinks Ship AHS off the coast of Queensland. Kuwait joins the United Nations. Carrollton bus collision: a drunk driver traveling the wrong way on Interstate 71 near Carrollton, Kentucky, United States hits a converted school bus carrying a church youth group. The crash and ensuing fire kill 27.
Who were born on May 14?